Personalized Name Pin, custom handmade to order. 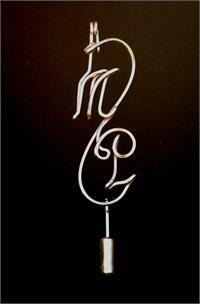 Personalized Name StickPin or Initial Stickpins. Lifetime quality 12k Gold Fill wire. Personalized Name and Monogrammed Accessories. Perfect personalized gift for any age. Great for Offices name tags, or wedding gifts. 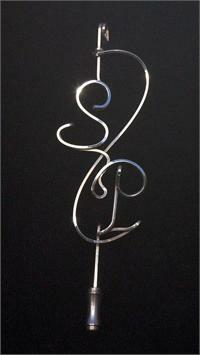 Script Name Pin Double Name Style Slant Pin in Sterling Silver Wire. Put any two names on a pin. Without the heart, use it for a business or Club gathering. 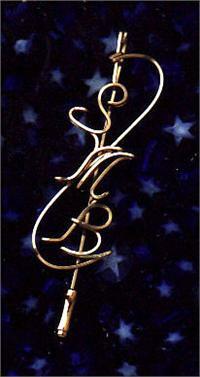 Script Name Pin Double Name Style Slant Pin in 14K Gold Fill Wire. Put any two names on a pin. Without the heart, use it for a business or Club gathering. 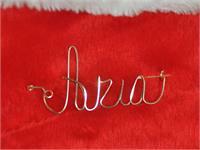 Script Name Pin Triple Name Style Slant Pin in Sterling Silver Wire. Put three names on a pin. Name Stick Pin. 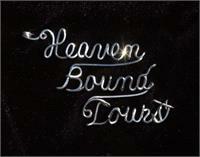 Another interpretation of the name pin.